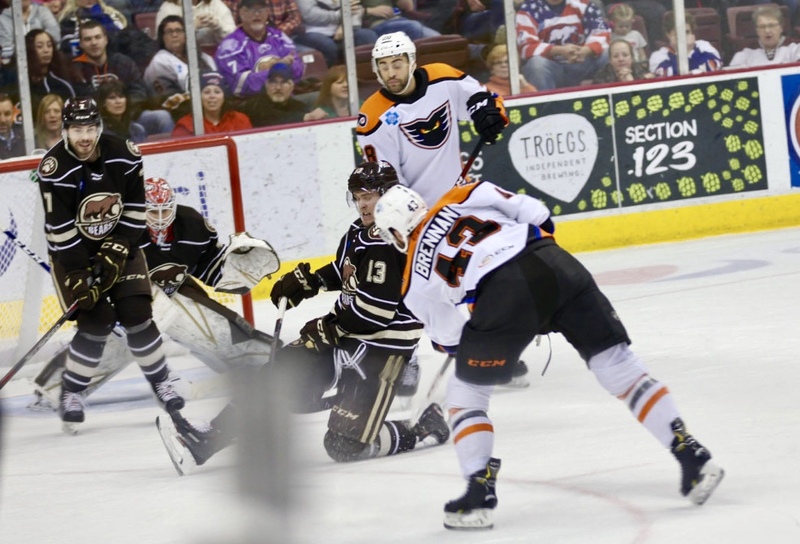 There have been quite a few new faces in Hershey this season. From the highly touted prospect to the well-traveled vet, change was abundant this past fall in Chocolate town. As one might expect, things got off to a very slow start. But a dreadful winless streak gave way to signs of hope, a few more wins, and now, a team that has gone 9-0-0-1 in their last 10 games. The team is starting to make noise, in a “bull-in-a-china-shop” kind of way, as the new faces begin to take root. Things have gone from “looking up” to “look out”. If you’ve been fortunate enough to catch any of the Bears game this season, you’ve undoubtedly noticed number 13, Beck Malenstyn. (If you haven’t caught any games, go). Malenstyn’s emergence (for me) began late last fall with a single, eye-catching, bone shaking hit, which was followed by another and another. These were NHL caliber hits by an AHL rookie. The “ooohs” and “ahhhhs” from fans that followed each hit told the story. Then his aggressive style of play began to unfold and take shape. Malenstyn’s tenacity and battle for the puck is eye-catching as well. Malenstyn’s latest trademark play seems to include colliding with opposing players along the boards, collecting the puck and dishing to an open teammate for the score. All while his opponent stays behind, collecting their senses and trying to assess what exactly just happened. Exhibit A (January 21 @ Bridgeport) – Malenstyn jumps on the ice after a line change and like a heat-seeking missile, tracks down the puck and feeds Garrett Pilon for the score. Exhibit B (February 6 @ Springfield) – Malenstyn once again takes the puck from the opposition and dishes to an open Steve Whitney for the score. On the defensive end, Malenstyn seems to seek shots to block on the penalty kill and defensive end, often throwing any part of his 6’-2” frame in the way of a shot. Oh, and Malenstyn will drop the mitts if he needs to. It’s easy to see why Bears head coach Spencer Carbery has likened Malenstyn to Tom Wilson. At times the 21-year-old appears to be a man amongst boys, even though most of his opponents have more age and experience under their belt. The left winger started the season on the 4th line, but has found a home recently on the third line with Garrett Pilon and Nathan Walker. Where is his spot in DC? Bottom six, or fourth line grinder is ideal, but Malenstyn has the potential for scoring as well. He could make a top six appearance at times. (See Tom Wilson). He has four goals and five assists in 45 games played so far this season. 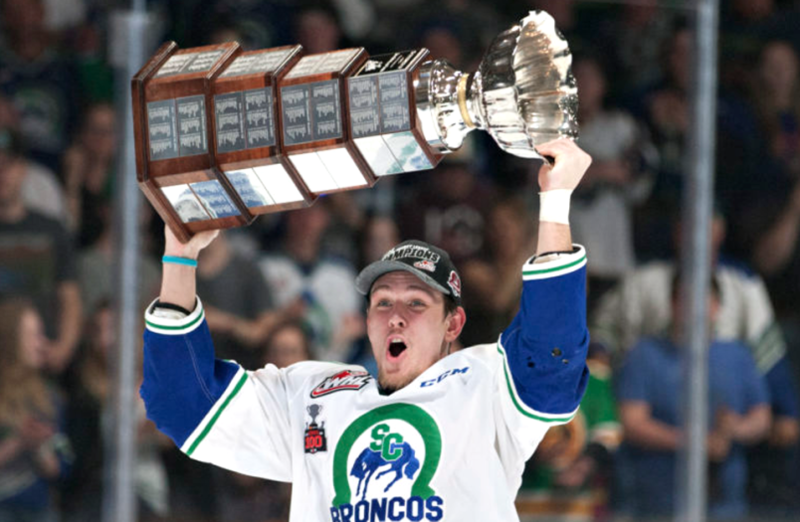 The White Rock, BC native spent the previous four seasons in the WHL, mostly with the Calgary Hitmen, but helped the Swift Current Broncos win the Chynoweth Cup last season. The Capitals 5th round draft pick (#145) in 2016 signed a three-year entry-level contract with the Capitals on April 10th, 2017 for $736,666 average annual value (AAV). He will be a restricted free agent in the summer of 2021 and is waivers-exempt this season. There will undoubtedly be more press on Malenstyn in coming weeks, but do yourself a favor, go see him play before the word gets out. This entry was posted in News and tagged Beck Malenstyn, Capitals Prospects, Caps Prospects, Hershey Bears, Washington Capitals Prospects. Bookmark the permalink. Malenstyn would look good in a Red Caps’ sweater. How about – tomorrow? I can think of at least three non-producers on Caps’ roster who should politely be sent to Mars (er, I mean traded or demoted) such that achievers like Malenstyn can take their places. 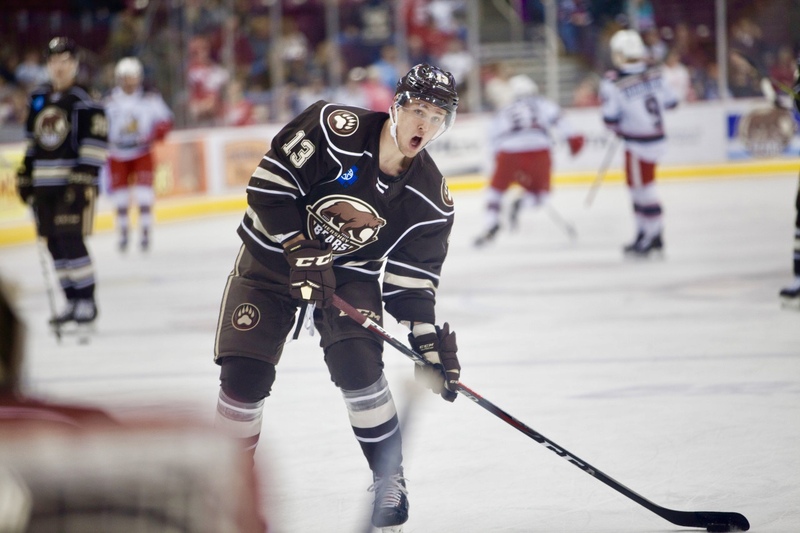 Sgarbossa is better than a number of his “betters” on the Caps’ roster, as are several other Hershey Bear forwards. Why is Tyler Lewington in Hershey and not in Washington to take the place of the hapless #22? He indeed would look good in a red sweater. He will likely get a good shot at one of those positions you mentioned this fall, maybe a callup sooner.